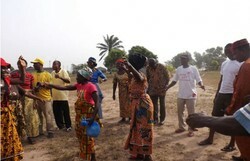 Community members of Jogbahn clan, Liberia celebrating news of President’s commitment to stop Equatorial Palm Oil from expanding its plantations on to their lands, March 2014. EPO has been accused by the communities of taking their land and clearing it without their consent. (2) In September 2013, community members were apparently beaten and detained by EPO security staff and the Liberian police on their way to lodge a complaint about the expansion to the authorities. (3) The company denied that it acted without community consultation or outside Liberian law. (4) The commitment by the President marks a significant victory in the battle for customary land rights to be respected….